I am honest and compassionate natural psychic and Tarot card reader. I receive symbolic and energetic messages through the tarot cards and I also feel and see messages. 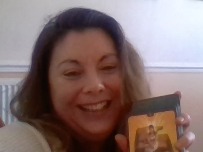 I always knew that I was psychic and was given my first set of tarot cards around the year 2005. I do not describe the cards, I read them in my own unique way as I feel this makes each of my readings individual to my client. Before I begin a reading, I explain my process and connect to the client through voice. I prefer for them to tell me nothing, so I can build a natural connection and trust. I like to give insight and inspiration into areas such as career & work, emotional insight and empathy and pick up on emotions in a current situation of caller. Although I am honest, I like to ensure my callers are seeing a positive future, no matter what life experiences they are currently going through. I enjoy nature, art, sewing, walking, cooking and all things spiritual including prayer and meditation. We don't currently have any testimonials for Misty. Check back soon to see what others have to say! Get 15 minutes to speak to Misty for just £4.99 (that’s a value of £22.50! )..